Photograph by J. Foust; courtesy of the Othello Community Museum. This line was served regularly with assigned power from Othello because of the business out at the Air Base and the U&I Sugar plant at Scalley and a side trip was made, as needed, on the Marcellus line. During the annual wheat rush, two separate trains were run to serve each of the branches switching needs. Towards the end of all Milwaukee operations out west, there were fewer locomotives than needed, so sometimes they were borrowed from the Tacoma area to run the branch. 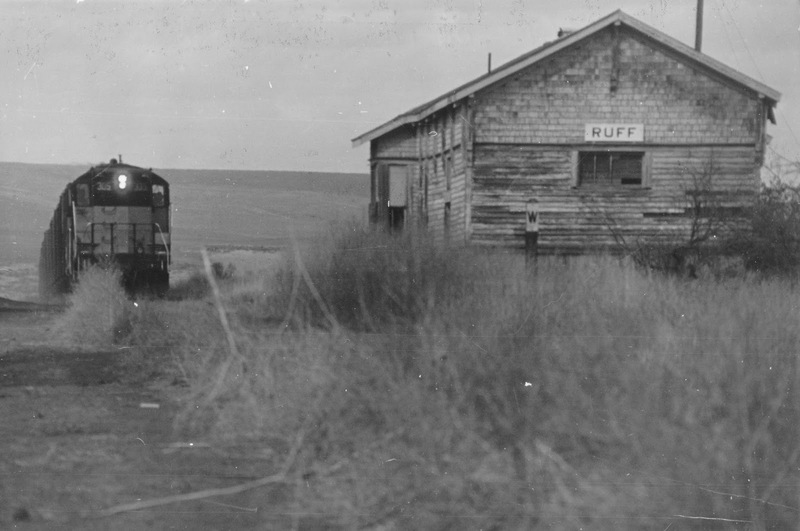 While it had been long closed, a train with boxcar loads of wheat passes the depot at Ruff on its way to the mainline at Warden.